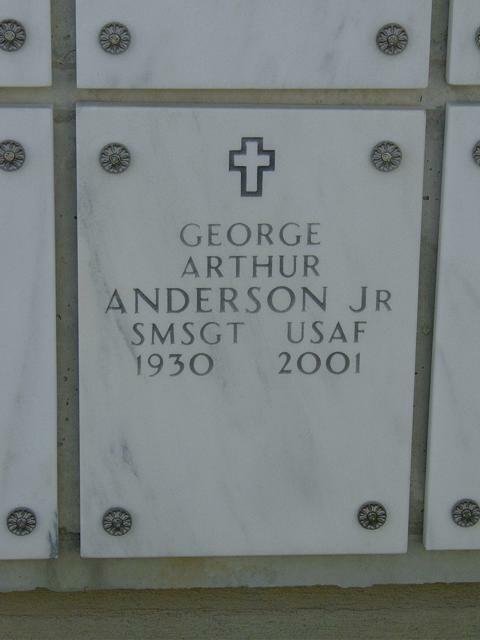 George Arthur "Andy" Anderson, Jr. passed away January 16, 2001 from complications following a lengthy illness. Sergeant Anderson was born in Orange, New Jersey on May 29, 1930. He moved to Fort Myers, Florida in the late 40s with his parents. He enlisted in the United States Air Force in January of 1951, later that same year he married Phyllis Bishop. taking basic training at Lackland Air force Base in Texas. During his career in the Air Force, he served in the Strategic Air Command as an Air Borne Electronics Technician, proudly serving under General Curtis E. LeMay. He was stationed at the following Air Forces bases, some of them two or three times: Keesler Air Force Base, Biloxi, Mississippi; Warner Robins Air Force Base, Georgia; St. Johns Air Force Base, Newfoundland; MacDill Air Force Base, Tampa, Florida; Lockbourne Air Fore Base, Columbus, Ohio; Hamilton Air Force Base, San Raphael, California; Bentwaters Royal Air Force Base in England; Alconbury Royal Air Force Base in England; and Davis Monthan Air Force Base, Tucson, Arizona. He also served many temporary duties in the Middle East and Europe. He retired as a Senior Master Sergeant in 1971. Throughout his Air Force career, he quickly made rank and received several commendations, medals and letters from base commanders as well as leaders of the community. He was very proud of his job and was constantly learning and improving his knowledge of the electronics field. During his career, he and Phyllis had six children. Debra Marie Patti, who now resides in Fort Myers, George Arthur Anderson III (Artie), deceased; Margarett Dianne Badgley of Fort Myers, John Douglas Anderson of Fort Myers, Robert William Anderson of Fort Myers and Donna Lynn Strickland of Tampa. After his military retirement, he moved his family back to Fort Myers to be closer to his parents, George Sr. and Lillian, who both passed away a few short years later. He began a new career at El-Tron TV, using the electronic technology he learned in the service. Following in his father's footsteps, he also was a very gifted artist. After illness forced him into an early retirement, he passed his days by designing and creating beautiful original clocks and dollhouses from wood. These spectacular creations continue to bring joy to all those lucky enough to possess them. His hobbies included building model airplanes and boats, fishing, bowling, boating, dancing and skating. He will be remembered for never allowing the "child within" go away. He was a quick wit, always making people laugh. He was a real pleasure to know and love. 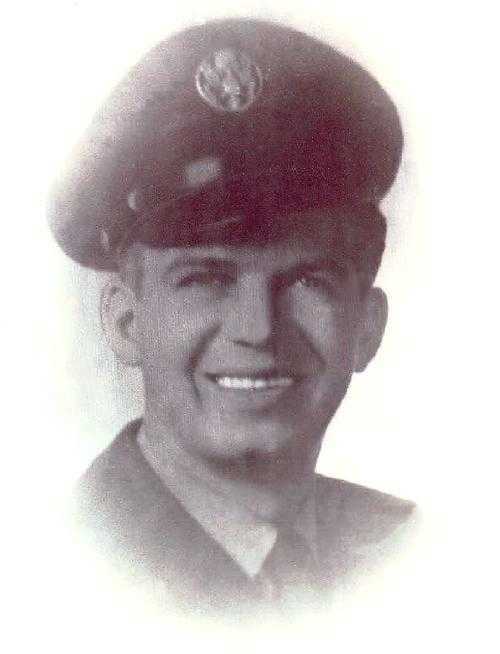 He left behind five surviving children, 14 grandchildren and six great grandchildren. Two of his grandsons, Kevin Matthew Caputo and John Douglas Anderson Jr. are proudly serving in the armed services. His granddaughter, Cearra Dianne Badgley is currently a corporal in Reserve Officers Training Corps. Interment, with full military honors, was held at Arlington National Cemetery on February 22, 2001. He was laid to rest in Court 6, Section Q, Stack 12, Niche 1. His fondest memories were of serving in the United States Air Force, being an American and being able to travel the world with his family. He served his country with pride and dignity; and for that, his family is proud.